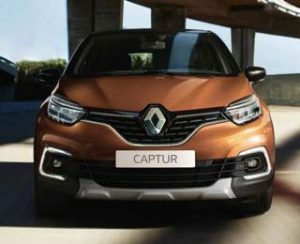 The Renault Captur is a compact SUV based on the delightful Renault Clio and shares a platform and engines with its main competitor the Nissan Juke, Renault and Nissan have been in partnership since 1999. Unlike the Vauxhall Mokka and as with the Peugeot 2008 there is no four wheel drive Captur, but unlike its french cousin that offers Grip control the Captur concentrates on being the best looking crossover in the car park, and it is a picture, particularly with the option of contrasting roof colour. 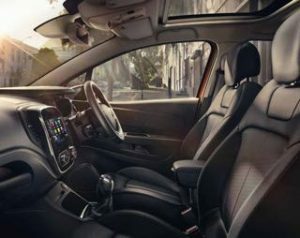 The Captur has received its mid-life pep up with the traditional new front grille and light fittings, inside there is an updated infotainment system, a posher-feeling interior with more soft-touch plastics. The 377-litre boot is easy to load because there’s no lip between the boot floor and the opening. You can drop the boot floor down to give you an impressive 455 litres of space, but this introduces a huge load lip to heave things over. To Mobility customers the Captur is available in new trim lines, Play, Iconic and GT line. Play cars have 16 inch alloys, a 7 inch touchscreen, automatic headlights and rain sensitive front wipers, LED front fog lights, cruise control, tinted windows, contrasting roof and door mirror colour, heated and electrically adjustable door mirrors, hands free keycard with keyless entry and manual air conditioning, Iconic trim adds 17 inch alloys, android auto and now Apple carplay link, automatic climate control, built in Sat Nav, privacy glass and rear parking sensors, the GT line adds, part leather, part synthetic leather, part cloth upholstery, automatic folding door mirrors, full LED front headlamps, hands free parking, LED daytime running lights, emergency brake assist, blind spot warning, front, side and rear parking sensors and reverse parking camera and heated front seats. 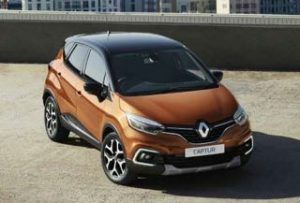 A three cylinder 0.9 petrol, a new 1.3 litre petrol with 148bhp, and a 1.5 diesel are the power options for the Captur, both the small petrol and the diesel have 90bhp to draw from and as a result progress is not rapid, 0-62 miles per hour in five speed petrol manual guise is 13 seconds and the top speed of 106 miles per hour keeps the Captur away from the boy racer brigade. The diesel copes better with the extra bulk of the Captur, the extra mid range grunt makes for a more engaging drive, economy of both engines is excellent but the diesel has a claimed return of 53.3 miles per gallon compared to 45.6 for the petrol. The 1.5 diesel is available with a six speed dual clutch automatic gearbox which increases the 0-62 time increases to 13.5 seconds. The new 148bhp 1.3 litre petrol is paired to a six speed dual clutch automatic gearbox and is able to reach 62 mph in 9.5 seconds and return 43.4 miles per gallon, it’s no sports car but it is the most fun you can have in your Captur.